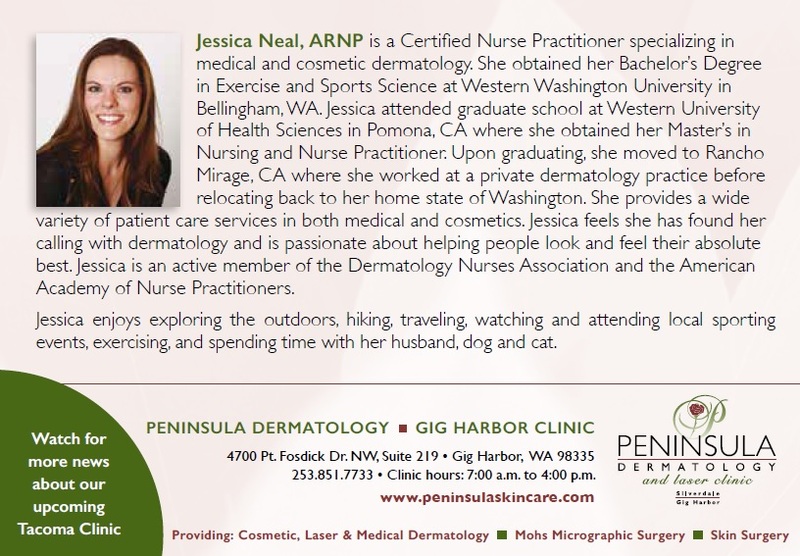 Peninsula Dermatology Laser Clinic & Spa is committed to providing the most excellent and comprehensive general dermatological, surgical dermatological and cosmetic dermatological care in Northern Pierce and Kitsap counties. 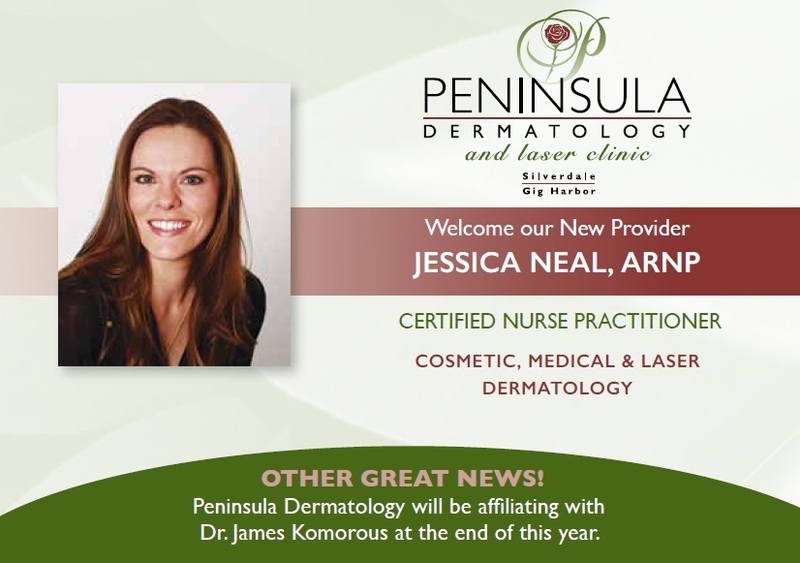 We provide a patient centered focus, offering a complete broad spectrum of dermatological services, we strive for 5 star patient care and take pride in enriching the lives of those we serve. 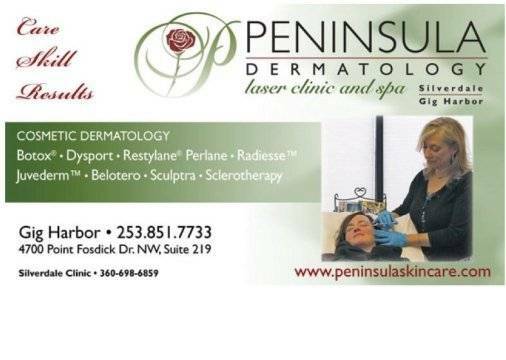 Peninsula Dermatology is a full service general dermatology and cosmetic dermatology practice in Washington State. 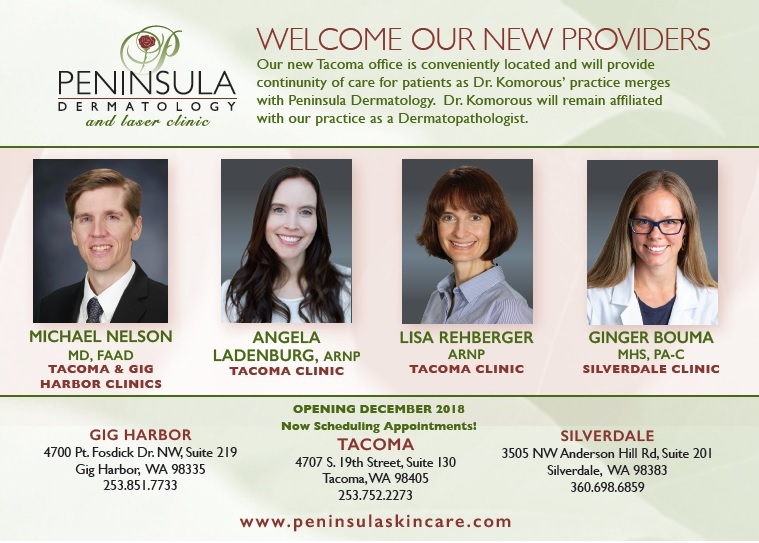 Under the direction of board-certified dermatologist Dr. Eric Rasmussen, we have three locations: Gig Harbor, Tacoma & Silverdale Washington. 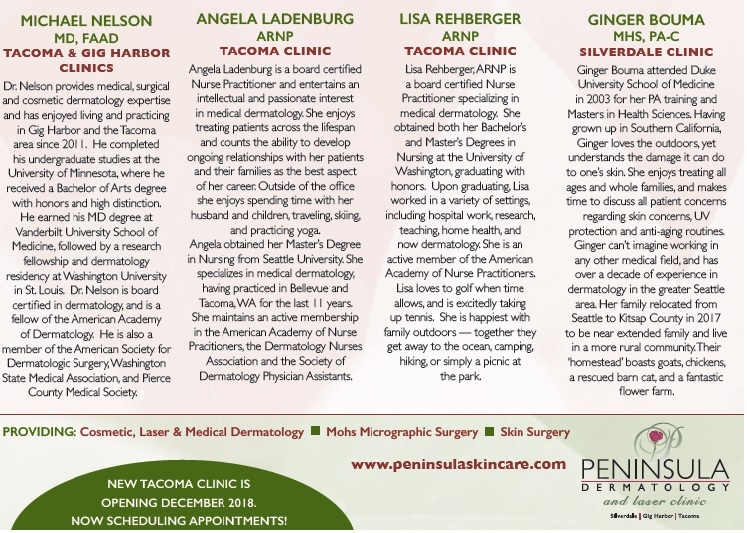 Our offices are staffed by 2 General Dermatologist, 1 Mohs Surgeon, 1 Dermatopathologist, 4 Nurse Practitioner, 4 Physician Assistants and 1 Clinical Aesthetician. 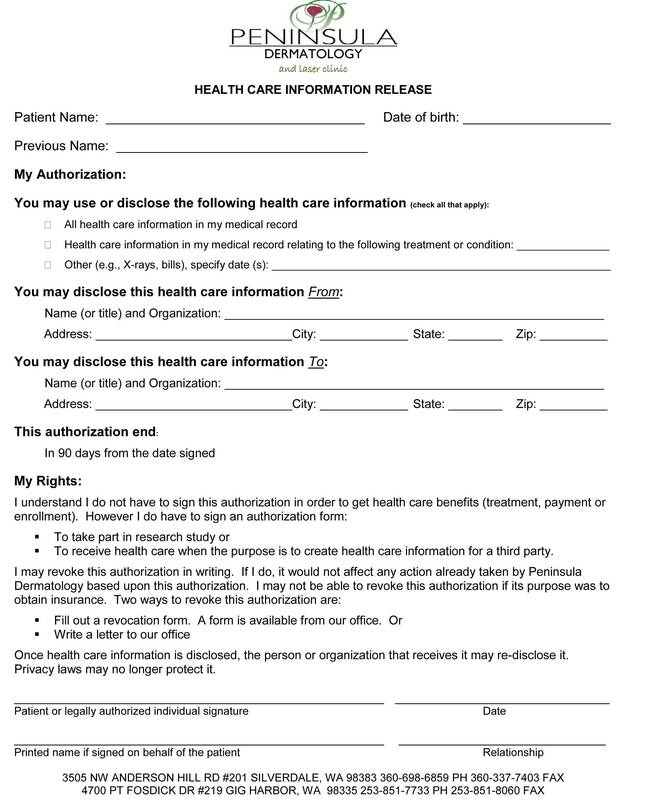 We treat both cosmetic and medical dermatology concerns. 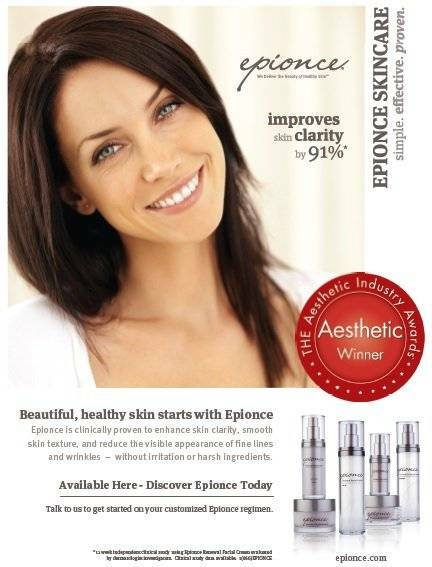 Common skin problems treated include eczema, hair loss, psoriasis, rosacea, skin cancer and warts. 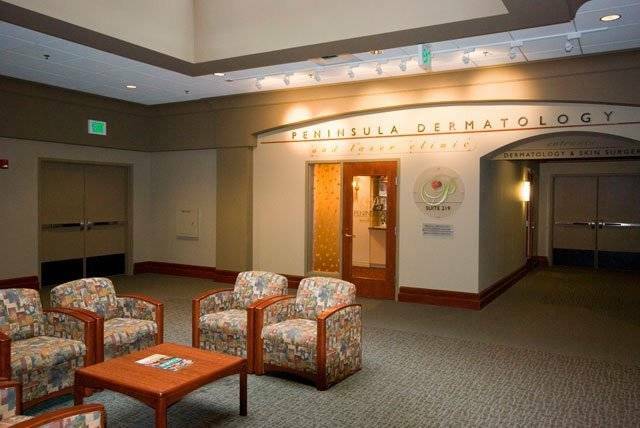 Our cosmetic dermatology practice includes lasers and skin resurfacing devices, and is noted for our specialty in acne, acne scars, and non-invasive cosmetic procedures. 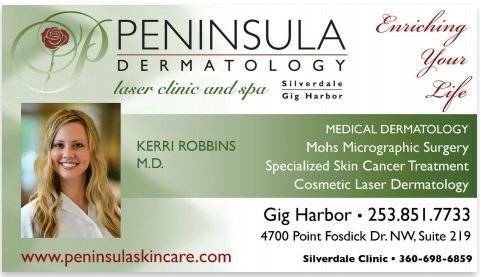 Mohs micrographic surgery is available. For many cosmetic dermatology procedures, we use a combination of fillers (Restylane®, Perlane®, Juvederm®, Belotero Balance®, Voluma® and Radiesse®). We offer Botox® as a facial muscle relaxant. Our lasers include facial resurfacing to produce great results with minimal downtime. To treat acne we use traditional medications as well as new laser and light treatments, such as Photodynamic Therapy. We use the non-ablative Clear and Brilliant®, Fraxel® Laser and the new Deep FX Lasers to achieve outstanding results not only for acne scaring but to improve tone and texture, reduce the lines and wrinkles. These lasers are great for the face, neck and chest. 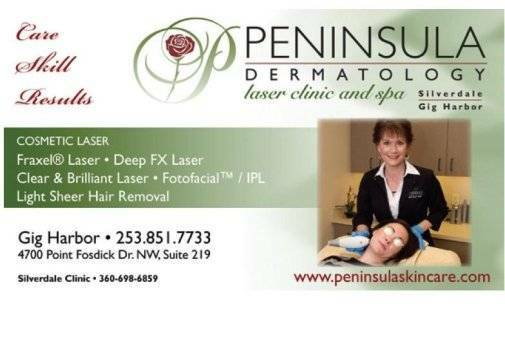 We also offer laser hair removal in both offices. We pride ourselves on delivering five star customer service and complete care to all our patients.